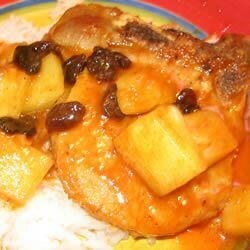 "Pork chops are simmered in a tangy sauce with pineapple and raisins before serving over rice. A favorite growing up!" Heat the oil in a large skillet over medium-high heat. Add the pork chops and fry on each side until browned, about 3 minutes per side. Pour in the liquid from the pineapple chunks, saving pineapple for later. Stir in the golden syrup and ketchup and season with curry powder, ginger, salt and pepper. Reduce heat to medium, cover and simmer for 30 minutes, or until pork chops are tender. When the pork chops are tender, pour in the pineapple chunks and add the raisins. Heat through briefly, then serve. This recipe is wonderful! I modified it a little by adding red, orange, and green bell peppers just before adding the pineapple. Served over brown rice and with a tossed salad--magnifique!